Once upon a time, usury was considered a sin and lending was subject to strict controls. Now, the world is in the grip of usury. It cannot continue. At some point it will have to be retired, or swapped to equity. A good place to start is third world debt, which is the most immoral variant. First, a glance at the scale of the problem. Global debt is estimated to be about $US220 trillion, which equates with over 300 per cent of world GDP. Japan is in the worst position, with a debt to GDP ratio of a staggering 250 per cent (the get out clause is that almost all of it is owed internally). America’s debt is officially $US18 trillion, about equivalent with its annual GDP, but there are some estimates that put it at about triple that. When unfunded liabilities are included, the debt figure gets even higher: $US150-350 trillion. At $US18-20 trillion every American man, woman and child owes something in the vicinity of $US60,000, and at the higher estimate, the per capita debt figure balloons. In Australia, government debt is comparatively low, despite the recent Budget deficits. It is just over 40 per cent of GDP, which is about half the level for most European countries. But Australian household debt is extremely high because of borrowing to buy into the housing bubble. According to the IMF, household debt is 100 per cent of GDP, compared with an average of 63 per cent in other developed economies. The ABS estimates household debt has doubled over the last two years from $94,100 in 2003-04 to $168,600 in 2015-16 — mostly borrowing for property. About 30 per cent of households are classed as over-indebted. These are the conventional figures, and they are well known. But there is another dimension to the global debt binge — leverage. The debauch in the financial system that led to the global financial crisis was based on investments known as derivatives: complex bets derived from more conventional transactions such as mortgages, share investment, interest rates or currencies. These are currently at a staggering $US700 trillion, almost ten times the size of world annual GDP. It represents an even bigger debt mountain. The way it works is that traders amplify their bets by borrowing massive amounts. For example, with one derivative, known as a contract for difference, they might put up only $5000 for a $100,000 contract, effectively borrowing the other 95 per cent. A once per cent change in the share price can turn into a $1000 profit or loss, which is 20 per cent of your investment. Nothing can possibly go wrong with that. "At the moment, global interest rates have been reduced to almost zero in an effort to put the whole disastrous mess into a holding pattern. But at some point debt will have to be cancelled or turned into equity." The point is that interest on debt always grows faster than the economy, and eventually it becomes unsustainable. Debt grows exponentially, while economic growth tends to be linear. As the economist and historian Michael Hudson has documented, the response by societies, dating back 4000 years, is to retire debt. That is why usury has been banned in many societies (it still is in Islam). At the moment, global interest rates have been reduced to almost zero in an effort to put the whole disastrous mess into a holding pattern. But at some point debt will have to be cancelled or turned into equity, which was the solution used in the Latin American debt crisis of the 1980s. Equity, which is called sharia finance in Islam, is different because the provider of the capital takes the risk, not the receiver of the capital (intriguingly, equity almost always performs better than debt because of the higher levels of trust involved). It is also worth revisiting why usury was banned — not least to understand how the banks, which are responsible for the debt binge, should be assessed in ethical terms. The thinking in the West is derived from Aristotle, who despised lending because it 'makes a gain out of money itself and not from the natural object of it'. 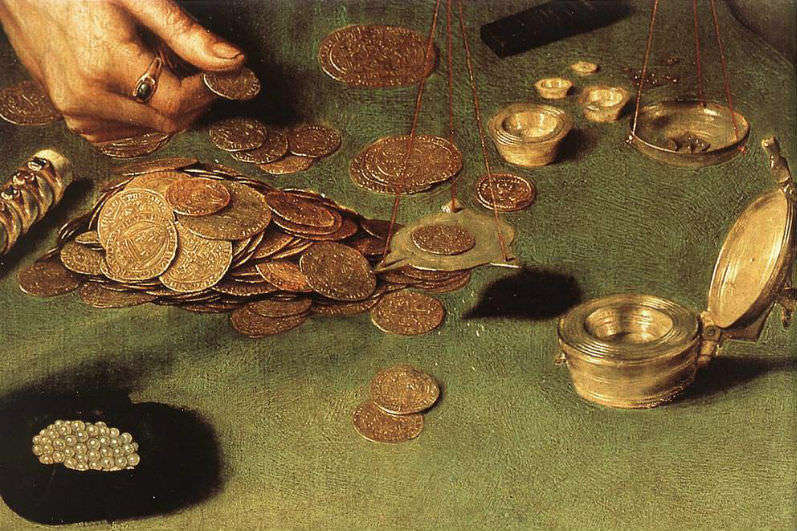 He argued that money was intended to be used in exchange but not to increase at interest, which he considered 'of all modes of getting wealth the most unnatural'. The point, which was keenly understood by 19th century economists like Adam Smith, is that money made from money is barren, inherently unproductive. 'Breed from barren metal' as Shakespeare described it. We are now in the grip of that barrenness. In most developed economies, including Australia, the FIRE sector (finance, insurance and real estate) is the largest part of the economy. As Hudson explains, they are parasites who produce nothing. For the future of our society, it is well past time to turn the spotlight on what they are doing and take measures to contain the damage. So David, you believe that it is time to put the spotlight on the practice of interest taking and to move to bring the damage under control. You are not the first one to voice such a concern but you may be waiting just as long as earlier critics to see any action. Way back in 1944, Brisbane solicitor John P. Kelly delivered the Aquinas Lecture in the old Aquinas Library in Queen Street on the theme “Aquinas and Modern Practices of Interest Taking.” It remains, in my view, one of the most lucid explanations of the Catholic condemnation of usury and is well worth your readers’ attention. It can be found, gratis, on the internet with just a little effort. Brisbane economist and advisor to the Queensland government at the time, Colin Clarke, provided the foreword to the published version of the lecture in which he had this to say: “At the heart of the great structure of present day usury lies what are called "national debts." … I think that I am on safe ground in predicting that during the next few years the budgetary problem posed by huge national debt interest payments will provoke, in every country in the world, a close study of the ethics of usury.” Well, I think that most people would regard the seventy three years since 1944 as being more than just a ‘few’ yet we are still waiting. In fact, excepting for obscure journals (forgive me editorial team) such as Eureka Street, the subject is barely mentioned. One of my hopes for the future of this country is that the influx of Muslims in recent years, who, as you say, also proscribe usury, might be the force which finally pushes us to dealing with this problem. Every wave of migrants to our shores has changed Australia in some way and my hope is that our Muslim brothers and sisters may be that force. So take heart David, perhaps you might not have to wait as long as John Kelly and Colin Clarke. Notwithstanding my esteem of Aristotle and Aquinas and their great common sense, I find it hard to understand their idea of interest as selling the same thing twice. If I lend a bottle of wine for a month, then I'm depriving myself of the choice to consume or not to consume that bottle in that month. I've passed that opportunity over to the borrower. In my span of 70 or so years, that’s one month less in which I have the benefit of this choice array with respect to that bottle. It seems just to me that a price can be demanded for the sacrifice of this opportunity. So interest payment, I submit, is by no means paying for the same thing twice, as Aristotle and Aquinas maintained. Rather, it's a payment for a benefit foregone which is tangible and distinct from the actual consumption of the loaned good itself. Neither St Thomas nor Aristotle raises this point, let alone meets it. As a free market advocate, I totally agree with David James’ proposition that our current crony-capitalist/socialist financial/monetary system is crook. But that’s another issue, and nothing to do with the alleged injustice of lending with interest.